Ripple (XRP) Price Analysis: A Move to $0.40 Next? In this analysis, we look at ripple (XRP) and anticipate support to be established around $0.40. The chart above is of the XRP-BTC pairing on the 8-hour chart. This chart is worth examining because it shows the substantial depreciation of XRP in relation to bitcoin (BTC). Considering the fact that bitcoin has fallen over 50 percent in the last month, this decline speaks volumes to how far that XRP has fallen in terms of its USD value. Here on the one-day chart for the XRP-BTC pairing, consolidation can be seen in the last few candles. Consolidation almost always precedes greater price action shortly after and this price action usually follows the trend. Thus, since XRP is in a downtrend, it will more than likely continue the pace of depreciation against bitcoin. This is corroborated by the low volume of the coin as well. Despite this fact, it could still increase in its USD value if BTC goes up. This is where we imagine that the depreciation in BTC would begin for XRP. Thus, for those looking to speculate on XRP to increase their BTC holdings, we’d recommend abstaining from entering into a long position for this trade. Above is a chart of the XRP-USD pairing on the one-day chart. As outlined in the chart above, the last day’s candle was an ‘indecisive’ one. Indecisive candles are typically identified by their shortness as well as the wicks that protrude from both sides. 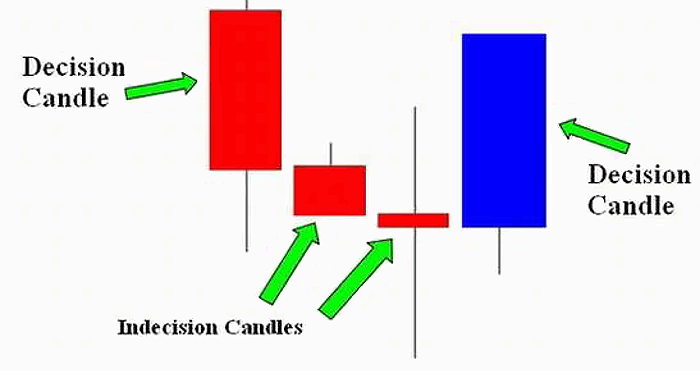 Decision candles that occur at the end of a long string of definitive, decision candles typically indicate that the run is waning for the time being. Thus, one should not expect any greater price action downward. However, XRP-USD does not look promising on any time chart. Let’s check out some of the indicators to get a better idea of its future movement. The MACD for XRP-USD on the one-day chart is still showing impending negative price action with no indicator whatsoever of the price movement reversing from its current state. The other indicators, i.e., Williams’, Ichimoku, Stochastics and others are equally as bearish. Therefore, further price movement south should be anticipated, and one should expect that this price movement will more than likely be triggered by any sudden move downward by bitcoin in the coming days. The forecast looks grim for XRP. Now that it’s fallen in this lower Fib level, it’s possible that XRP completes the full 100 percent retracement and hits sometimes around the $0.25 mark; this would be a near 70 percent drop from where it stands currently. While is an audacious prediction, there is nothing in the charts currently that contradicts it. As one more confirmation, we’ll go to a shorter time frame to see if there’s anything to indicate that our presuppositions may be incorrect. The 4-hour chart is revealing equally as bearish sentiment. The volume has dropped off, which is usually preceded by a negative turn in price, and the dojis have converted to indecisive after formally being green for a few brief periods (most likely due to bitcoin’s bounce back). We recommend setting your short target/long re-entry for $0.40 and below (conservative estimate). The author would be surprised if ripple defies the current bear market that is enveloping it currently. This is an audacious recommendation, but the chart says what it says.